We were very impressed with both the product and the delivery time for our order. We could not be happier with your performance, as well as the performance of the product! Hooray for Cable Chick! Unlike B1 and B2, the Bananas in Pyjamas, this pair of banana plug speaker connectors are pyjama-free. Instead, they come colour coded with the latest in banana fashion - red and black colour coding bands styled within a 24k gold plated socket! And, they're more flexible – they can both unscrew and be used as bare-wire binding posts. So, it's it time you hid your speaker cables inside your wall, floor or ceiling – it not only makes your entertainment area look tidy, but it makes changing components out easy work, since you only have to trace short cables at either end rather than long, snaking runs of spider-infested wiring. 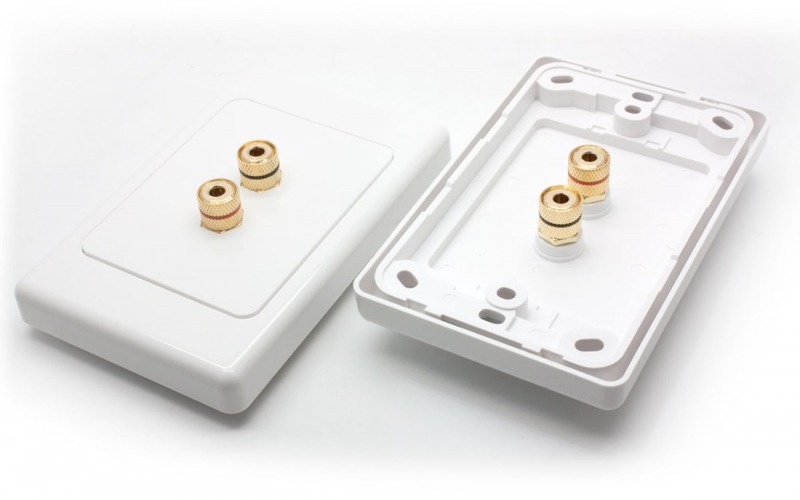 The wall plates also feature removable cover plates for easy installation and painting, and the binding posts require absolutely no soldering. That means no fiddling and no hassles! I'm just writing to let you know that I was very impressed with the easy order process and efficient follow up for the 3-speaker wall plate that I purchased through Cable Chick two weeks ago. I found the price to be very competitive, and then there was the prompt delivery, good quality, efficient follow-up, and the free mintie in the pack as a nice surprise! I'd had some trouble finding a wall plate allowing for 3-speaker connections through the electrical shops here in Adelaide, and was delighted to find just what I'd been looking for on the Cable Chick website. I ordered the product via the internet one afternoon, received a confirmation email almost immediately, and then actually received the product here in Adelaide the next day, which was great. I've now installed the product and it's been working very well with my in-ceiling speakers - allowing easy connection of the cables through the ceiling and walls into the wall plate, and from there into my Amplifier. This is the first time I've ordered a product from Cable Chick, and I'm glad I stumbled across the website in my frustration at not being able to find what I needed elsewhere. I certainly think I'll use the company again at some stage, and recommend it based on my experience. Thanks for your service and support. Answer: "Yes, the back and front are the same style binding post which can accept bare wire on the screw-down thread or a banana plug." Answer: "Our standard wall plates can take up to 10AWG (front and/or back) without issue."